I sometimes make these rolls the night before we need them and leave them in the fridge. 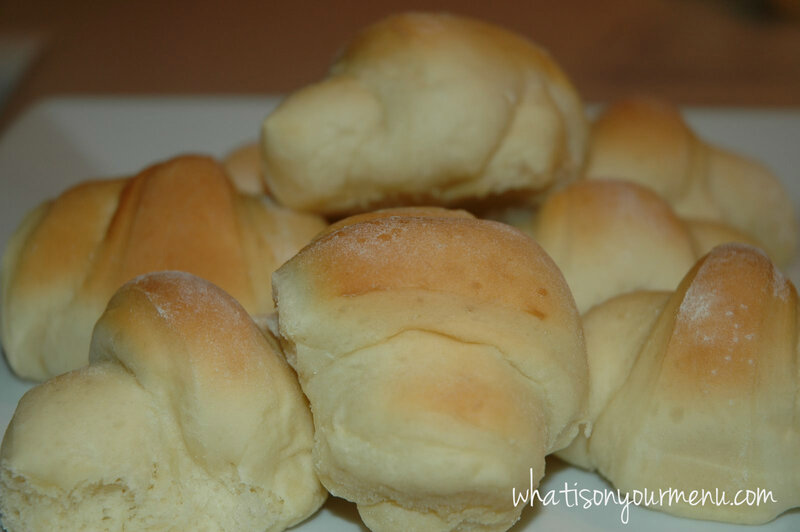 Then I pull the rolls out of the fridge and let them rise on the counter for an hour or two until they're puffy and ready to go into the oven. They're really not fussy rolls and the rising time doesn't matter too much, just as long as they rise a little. Heat water in microwave until warm (not hot or it will kill the yeast). Add water to mixer bowl (I use my kitchenaid). Add sugar, yeast and oil to water and stir to combine. Cover bowl (I use a dinner plate) and sit for 10 minutes or so until the yeast mixture is bubbly. When the yeast mixture is bubbly, add beaten eggs and salt. Gradually add flour. (I mix this in my kitchenaid with my white flat beater -- the one I use for cookie dough.) Dough will be a little sticky, but add enough flour that it's not super sticky. Prepare a well-floured surface to roll out dough. Divide dough into two sections. Roll each dough section into a circle. (I usually sprinkle a little flour onto the top of the dough before rolling out and rub some on my rolling pin too). Brush each dough circle with melted butter if desired. Cut with a pizza cutter into 16 triangles (like you're cutting a pizza). Roll up each triangle starting at fat end and ending at the point. Place on cookie sheet. Let rise until doubled in size. Bake at 375 for 10 minutes or until lightly browned. Recipe from my sister-in-law, Meagan, but rewritten how I actually make them.